A CORONER HAS returned a verdict of medical misadventure at the inquest into the death of a nine-month-old baby with a congenital heart condition. Baby Eoin Julian, the only son of Aine and Sean Julian from Ballylinan, Co Laois died at Our Lady’s Children’s Hospital in Crumlin on 30 December 2015. His parents were told weeks before his death that his heart condition had stabilised and his future looked bright. “Little Eoin brought so much love into the lives of all who cared for him during his short life,” the infant’s parents said. Through their legal team, the Julian family expressed concern over a number of issues that emerged at the inquiry, including staff lack of awareness of hospital guidelines and communication issues between medical teams. 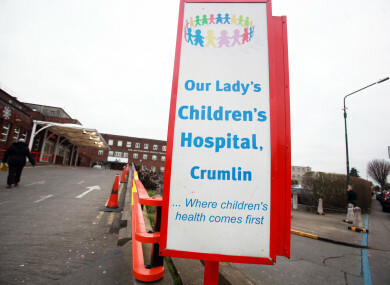 Dublin Coroner’s Court heard a temporary medical chart was used because the baby’s full chart was missing. The hospital apologised unreservedly for shortcomings in Eoin’s care and for the distress and suffering the child’s death caused to his family. Barrister for the family Roger Murray said it was the parents’ express wish that lessons be learned from a hospital review that followed Eoin’s death. Recommendations are currently being implemented and the family felt these could be extended to improve standards of care nationwide. “The family would be very consoled to hear these were being followed up in their entirety,” Murray said. The child’s parents initially brought Eoin to hospital because he had a cough that was not improving. Baby Eoin was admitted to Our Lady’s Hospital in Crumlin on 29 December 2015 with a respiratory tract infection. He had been diagnosed with Noonan’s Syndrome with an associated congenital heart condition shortly after birth. However, his consultant Paediatric Cardiologist Dr Orla Franklin had expressed optimism about the baby’s prognosis weeks before he died. The inquest heard following admission the child was reviewed three times to determine whether he should be placed in intensive care. The court heard that a respiratory consultant’s specific instructions for use of a CPAP ventilator for sleep apnea were not followed. Baby Eoin was crying and distressed and his parents grew more and more concerned overnight. The following morning, two calls at 10.20am for medical assistance from nursing staff went unanswered. A medical team responded to an emergency arrest call at 10.43am and the child was prepared for transfer to the pediatric intensive care unit (PICU). However, the nurse charged with receiving him said she was not made aware of the urgency of the situation. Baby Eoin was transferred to PICU just before noon, but at 12.20pm he suffered a cardiac arrest from which he could not be resuscitated. The dying infant was placed in his parent’s arms. The cause of death was acute cardiac arrhythmia due to bronchial pneumonia in the context of an abnormal heart. Coroner Dr Myra Cullinane noted the child’s positive prognosis despite his early challenges in life. “It is particularly poignant to hear Dr Franklin’s evidence as to how he might do in the future,” the coroner said. Email “Verdict of medical misadventure returned at inquest into death of nine-month-old baby”. Feedback on “Verdict of medical misadventure returned at inquest into death of nine-month-old baby”.